Dr Gwyneth Verkerk, Chair of the National Animal Welfare Advisory Committee; Stephen Colson, Planning and Policy Manager at Mercury Energy; and Phil Journeaux, an agricultural economist with AgFirst, delivered an informative presentation to the Waikato Branch of RMLA in December 2016, reflecting their experience as the Community, Energy, and Rural Professionals representatives of the Collaborative Stakeholder Group for the Healthy Rivers Wai Ora Project. 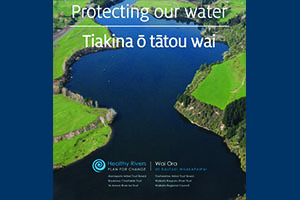 The Healthy Rivers/Wai Ora initiative in Waikato presents a unique approach to co-governance, co-management and collaborative resource planning in New Zealand. As a co-sponsored process initiated by Waikato River Iwi and the Waikato Regional Council, the process provides an interesting case study for resource management practitioners. The presentation provided an overview of CSG’s the CSG’s role and operation and a summary of the Healthy Rivers Wai Ora Proposed Waikato Regional Plan Change 1, which is now out for public submissions. Gwyneth has a veterinary background, specializing in animal husbandry, stockmanship and animal welfare. After completing her doctorate she worked as an animal scientist with DairyNZ. She is currently the Chair of the National Animal Welfare Advisory Committee and was formerly New Zealand’s representative to the World Organisation for Animal Health. Stephen is the Planning and Policy Manager at Mercury Energy. He is a member of the NPS Freshwater Management National Objectives Framework Reference Group and is involved in the Land and Water Forum, maintaining a continuing interest in freshwater and energy-related initiatives, both at a regional and national level. To view and download the presentation please Click here.